Louise Allan joined the practice in 2008 as a nursing assistant. She then achieved her Diploma in Veterinary nursing in 2013 and was promoted to head veterinary nurse in 2016. You will normally find Louise in either our St Andrews and Newport branches. 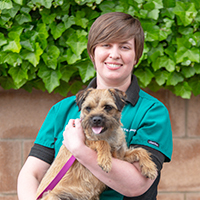 Louise's interests include Imaging, dental care and feline friendly care. Louise was in charge of our successful bid for gold level accreditation in the International Society of Feline Medicine's Cat Friendly Clinic scheme.